In short, it does depend on your financial institution and whether or not they recognize powers of attorney. It also depends upon whether the asset has been moved into the trust. If the asset has yet to be moved into the trust the trustee still does not have power over them. Therefore, I wanted to redraft the durable power of attorney for these individuals in order to allow them to get help paying their bills. 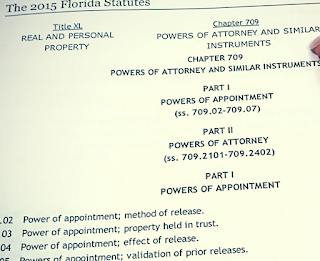 However, I didn't feel right about using the typical formatted durable power of attorney document which provides for a named agent power of attorney and a successor agent for the same which can trigger the power either immediately (immediate power) or upon incapacity (springing power). I wanted the Husband and Wife to both be in control of one another's financial affairs while they are still able, however, I wanted to set up the document so that the successor trustee could also serve in this role. I felt confined by typical drafting and wanted to truly understand the designation of agents within powers of attorney. Therefore, especially being young I started where I always want to start my research. The rules. Florida Statute Chapter 709. A great planning technique I will now consider is not just to have an agent and a successor agent designated on the power of attorney, however, I will utilize what the rules define as a co-agent. 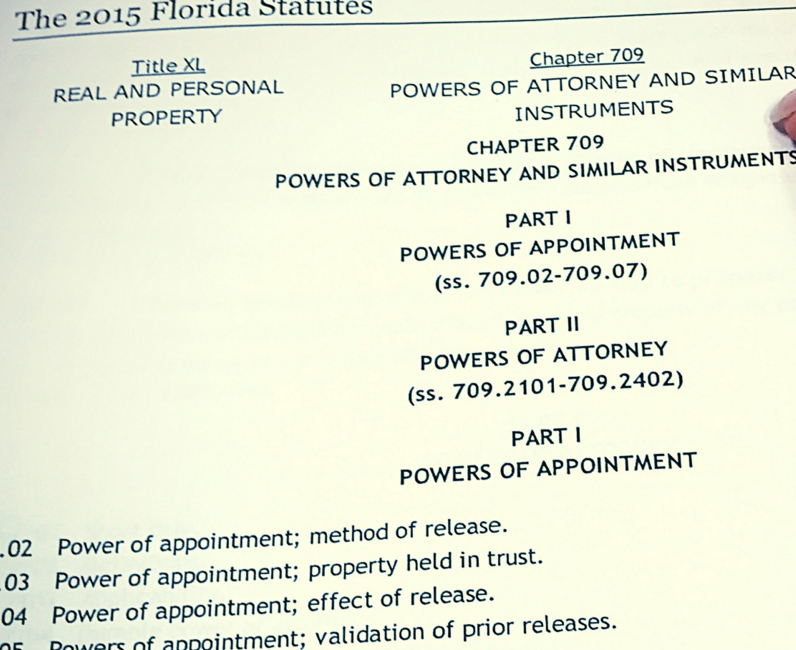 Florida Statutes clearly lay out the fact that a principal may designate two or more persons to act as co-agents and that unless the power of attorney otherwise provides, it is assumed that the co-agent may exercise its authority independently. Therefore, if you have two children you would like to provide this power to you don't have to give one power and then wait until they either reject it or can't fulfill the role to give the other child power of your finances. It can be a co-agent relationship decided individually which could be very helpful in the right circumstance. In conclusion, I was able to reformat the typical durable power of attorney form to now allow husband and wife to serve as agents to one another and to additionally allow their successor trustee to serve as a co-agent on the power of attorney so their trusted daughter can immediately help them pay their finances. I learned a valid tool in my career as a lawyer today. Never be constricted by the past and how things were, but always strive to learn and better what has already been done. /s/ Natalie A. Staroschak, Esq. Engineered and Designed by Digital Marketing Agency VuStudios Inc. © 2016. All Rights Reserved.